2012 Will Bring The Appification Of Media For years now, the line between the software business and the media business has been blurring. Software applications used to take the form of packaged goods, sold through retail outlets at set prices. Today, as a result of cloud computing and other advances, applications look more and more like media products. New Sun-Times’ See Highly Digital Future Chicago technology entrepreneur Michael Ferro and former Newsday Publisher and CEO Timothy Knight lead the group. Knight says flagship tabloid newspaper will remain an integral part of the portfolio. Mobile retail dollars doubled between April and December The share of online retail dollars attributable to mobile devices in the United States doubled from 1.87 percent in April to 3.74 percent in December, according to a new report from RichRelevance. How the Boston Globe Pulled Off HTML5 Responsive Design On Monday, The Boston Globe released its new premium content mobile initiative dubbed BostonGlobe.com. That is not to be confused with Boston.com, its free flagship website. 8 Daily Deals Gone Wrong – When the Deal was No Bargain Daily deals can go wrong for a lot of reasons and it’s not always the fault of the deals provider. iOS Dominates Mobile Shopping in December Evidently, iOS is the platform of choice for mobile shopping. At least that’s the gist of a new study. Gen Y, Boomers On Same Smartphone Page Boomers … they’re just like Millennials, at least when it comes to smartphones. Christmas Sets Record With 242M App Downloads Apparently, a lot of people spent Christmas Day turning on their new smartphones and downloading apps. Assessing the data from the busiest day of the year for activations and app downloads, Flurry Analytics found consumers shattered records for both this year. New York Times sells 16 regional papers for $143 million Halifax Media is buying 16 newspapers from The New York Times in a deal that is expected to close within the next few weeks. Newspapers don’t need to reinvent the wheel, just package it better At a time when newspaper buying habits — and advertiser habits — are dramatically changing, we need to be developing products that will engage around new behaviours, not defending old practices. Apple Preps For Q3 iTV Launch The supply chain of Apple will start preparing materials for iTV sets in the first quarter of 2012 in order to meet Apple’s schedule to launch the new display products in the second or the third quarter of 2012, according to industry sources. Small Newspapers Anxiously Eye USPS Kevin Bottrell and Sharon Friedlander shudder when they think about the effects another postal shift could have on their newspaper. 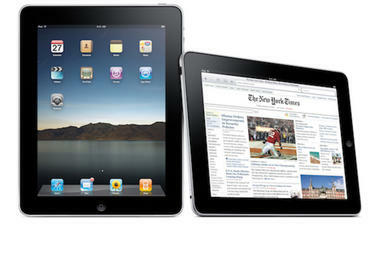 Can A Google Tablet Compete Against iPad, Kindle Fire? Google could be the next technology company to throw its hat into the tablet ring, but can a Google tablet compete with the immensely popular iPad and recent newcomer Kindle Fire? Bundles Are The End Game, Not Paywalls The coming year will see news organizations asking more readers to pay for digital content – not just online, but also on smartphones and tablet devices. It will be especially noticeable for Canadian readers, and crucial for news media outlets here seeking a new revenue source. Newspaper Chain Is Switching 8,500 Employees To Google Apps One isolated case doesn’t make a trend, but Microsoft should be worried about cases like the McClatchy newspaper chain. Apple television said to run on custom-built chips like iPhone, iPad Rather than utilize off-the-shelf chips from a company such as Intel, Apple is expected to use its own custom-built chips like in the iPhone and iPad for its anticipated television set. Moms Prefer Digital Shopping Over In-Store Describe almost any mother of small children and one word comes to mind: busy. Milwaukee Journal Sentinel to introduce pay wall Jan. 4 With its digital offering, called “JS Everywhere,” the Journal Sentinel will offer access to JSOnline.com, the Journal Sentinel e-edition, its mobile site for smartphones, plus coming iPad and other digital applications for a subscriber’s fee. Thank you for reading! If you are so inclined, please let your colleagues know about digitalfirstnewspapers so they can get newspaper specific updates on digital, mobile and social delivered to their inbox. This entry was posted in Circulation, Newspapers and tagged ABC, circulation, digital first, Freedom Communications, iPad, iPhone, linkedin, McClatchy, Media General, NAA, newspaper circulation, newspapers, Scripps, tablet. Bookmark the permalink. Nice work here. Very helpful.